Attorneys Erin P.B. Zasada – Zimney Foster P.C. Erin P. B. Zasada (ezasada@northdakotalaw.net) joined Zimney Foster P.C. in 2012. She is licensed to practice in the state courts of North Dakota, Minnesota and Montana and is licensed to practice in the United States District Court in North Dakota and Minnesota. 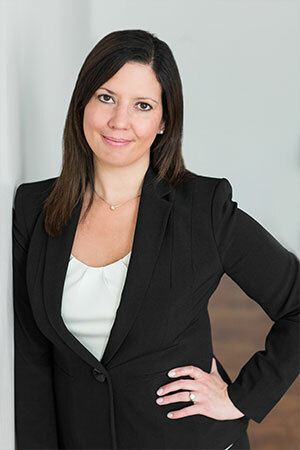 Erin’s practice area is primarily focused on the representation of creditors and the enforcement of creditors’ rights. Erin graduated from the University of Manitoba in 1999 with a Bachelor of Arts degree. She earned her Juris Doctor with Distinction from the University of North Dakota in 2003. During law school Erin was a member of the North Dakota Law Review and was the Symposium Editor of the North Dakota Law Review. She is the author of an article titled “Civil Rights – Rights Protected and Discrimination Prohibited: Living in Sin in North Dakota? Not Under My Lease North Dakota Fair Housing Council, Inc. v. Peterson, 2001 ND 81, 625 N.W.2d 551, published in 78 ND Law Review 3, 2002. Prior to joining Zimney Foster P.C., Erin served as the law clerk for the NorthEast Central Judicial District Court in Grand Forks, North Dakota. She also practiced creditors’ rights law in Fargo North Dakota and Golden Valley, Minnesota. Erin is a member of the American Bankruptcy Institute and the Commercial Law League of America. Erin also serves as a member of the Small Business Committee for the Grand Forks-East Grand Forks Chamber of Commerce.